I guess it isn’t exactly cooking in the normal sense, but we’re prepping for the cookbook. 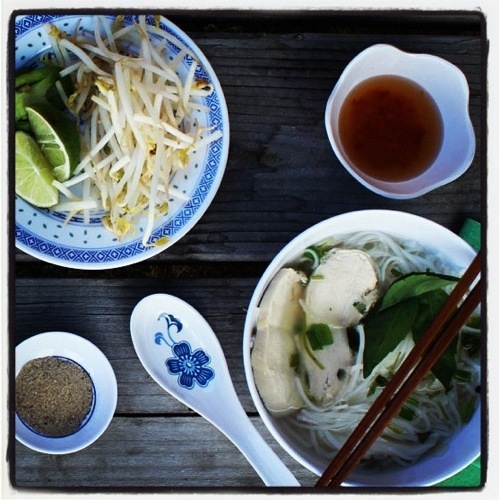 I came up with a pretty good list of Vietnamese foods we came to love while living there and now it’s time to prepare and photograph each one of them. Tonight it was sinh tố bơ, otherwise known as an avocado shake, and Vietnamese yogurt, sữa chua. With our out-of-season heat today, it was the perfect dessert! 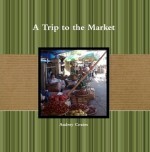 If you want the cookbook, check out the Ninh Binh perk! ≈ Comments Off on Does editing ever end? I am fairly certain that the answer is no. It’s amazing how many times I have revised sections of the book. Now, in anticipation of having a professional editor read it, I am petrified that I am doing it all wrong. The real struggle is keeping the voice, my voice consistent. 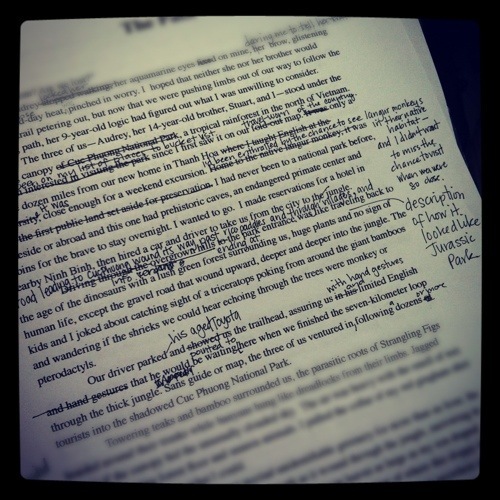 I fall back into business writing sometimes–cold, but detailed. I can write scenes just fine (even Cheryl Strayed told me that when she read an excerpt) but getting the emotions in there is a different story. That’s the thing about memoir; it’s all about admitting your weaknesses, your pain, your failings. Without them, it isn’t nearly as enjoyable to read. But putting them in is a constant struggle for me. Rest assured, dear reader, you’ll know more about me and the things I have done, both right and wrong, by the end. You can thank the myriad writers and friends who have made me promise to edit and add and re-word until the pain shows through. I thank them profusely. There are some days I wonder why I decided to do this, but most days I’m still just wishing I had a dozen or so more hours to get things done. The to-do list is staggering these days between work, making a cookbook, editing/re-writing a book, running a sewing drive and trying to get folks to support the fundraiser. Add in family obligations, too. Those are never-ending, right? But really, every day I’m grateful for a little more support. Today it was in the form of a guest post on Threadbias. The sewing community has been awesome and I’ve got a handful of people already willing to make things for my orphanage friends. So. Grateful. One of the projects that I’ve really wanted to do for a long time is to have things made for the orphans in Tam Ky. I’ve made a few things and we’ve been lucky enough to have people donate clothes, toys, books and money that we brought along on our last two trips to the orphanages. But I always wanted to make it bigger than me just sewing a few things for a handful of kids. That’s where you come in. Affectionately known as The Tinies, we worked with them at the Home of Affection. 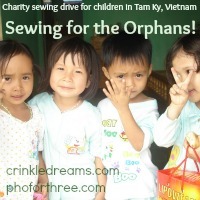 As part of our Pho for Three fundraiser, I’m heading up a charity sewing drive to get quality, handmade items to these kids I love so much. There are five things, in particular, that I’m asking for: shorts, dresses, messenger bags, pencil pouches and simple diapers. Depending on your time, sewing abilities, spare fabric, etc. you can pick whichever one you want to make. With more than 100 kids ranging from newborn to 17 years old, there’s plenty of leeway. Sewing starts now! 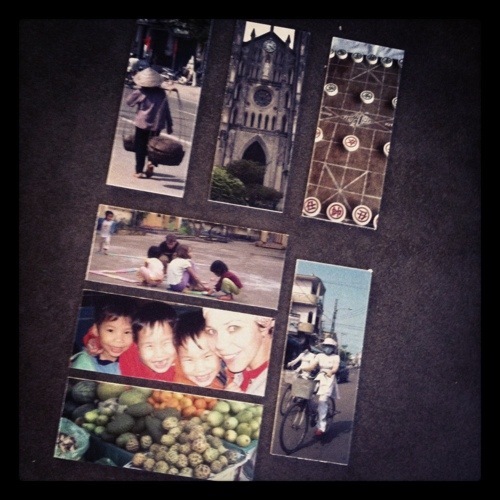 I will need to receive items by September 30, 2012so they can go back with a friend who is stateside in September. She is currently living in Tam Ky and will be doing some transporting. Otherwise, items will be shipped via DHL (cash donations to cover that cost are welcome) and brought with us if we are able to return in Spring 2013. You can send them to me directly, please email for the address. Items should be sewn with the intention to hold up under heavy use. The kids don’t get new things very often, so they need to wear well. If you are interested in donating something else (shoes, jackets, blankets, quilts, cash), please contact me to make arrangements. To get you started, here are some great online tutorials and some links to patterns that would be perfect for this project! Simple triangles of cotton: Easily made by taking a 25-inch square, cutting it into two triangles and finishing the edges (serger or turned seams). 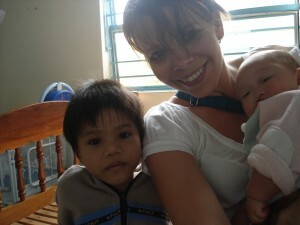 The Children of Vietnam (NGO) works to provide formula for these babies. This little guy was one of my favorites–always happy! 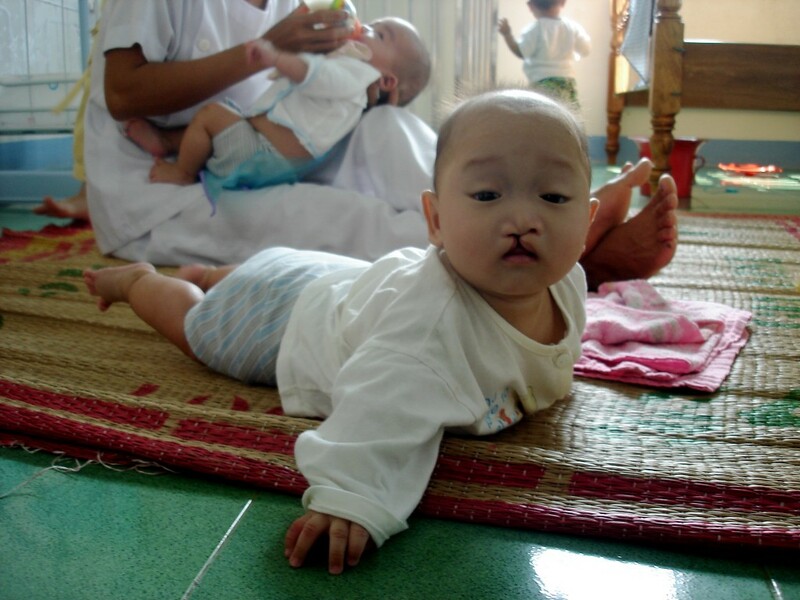 He has since had his cleft lip and palate repaired thanks to donations. For each of the next four weeks, I’ll be posting my own tutorials on making each of these items as well as sewing up as many as I can. Thank you so much! I really can’t do this without each of you. I honestly believe that one person can make a difference, but it’s so much better when it’s a bunch of us working together. If you have any questions at all, please ask in the comments below or email me. Just a few of the various pics we used for the new cards I ordered from Moo Stuart and I chose 20 different images from both our 2007 and 2009 trips that, to us, really evoke the feelings of being in Viet Nam. It’s nice to finally do something more with a tiny portion of the thousands of photos we took, too! 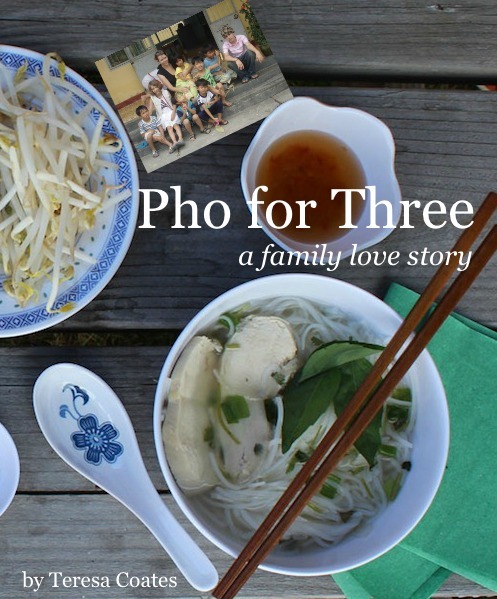 The kids and I spent Monday afternoon trying to take care of all the necessary parts of photographing the cover for Phở for Three. I’ve had various ideas floating around for a while, all revolving around eating phở at the open market in Thanh Hoa. It was just across the street from Hong Duc University where I was teaching and we spent a lot of time there, eating both the noodle soup and another favorite: bùn chả. In the evenings, we’d head across the busy street and enjoy ice cream–our pale faces always the center of attention. 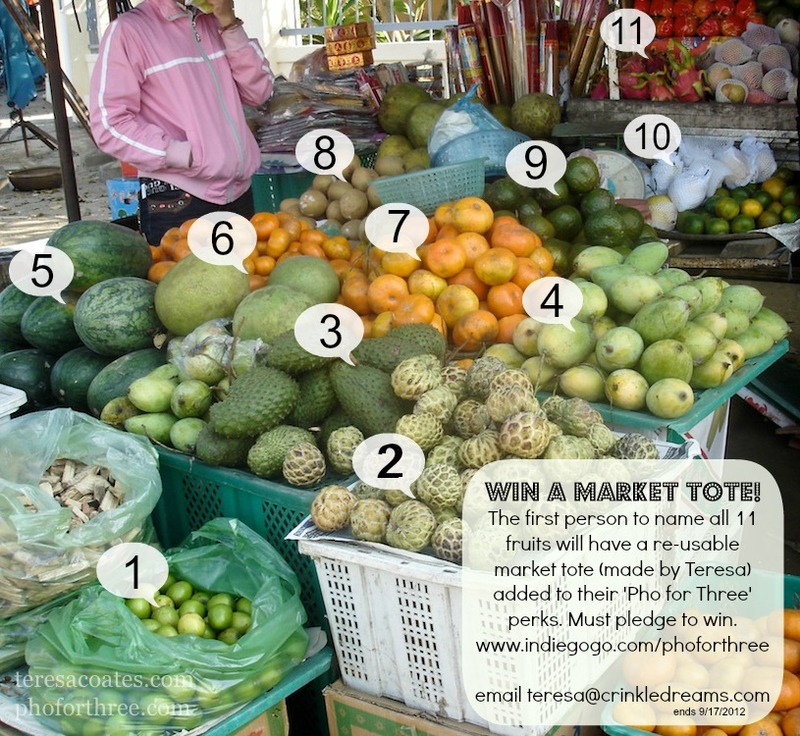 It was the memory of that market, along with the one in Tam Ky, that I wanted to honor with the cover photo. We got the soup, its necessary accoutrements, along with Viet coffee and pineapple, then spent 20 minutes arranging and re-arranging the dishes until it suited me enough to start taking pics. Of course, last night I spent my insomniac hours wondering about every.last.detail. But it’s done for now—just need some editing (by a skilled friend) to add in a few other elements and put the title on there. I’m afraid how long it’s going to take me decide on a font, though. Any ideas? Through the kindness of others, it happened. Special thanks to Susan Beal, for letting us take over her backyard for an hour; to Prado, who let us borrow his camera; to Stuart, my photographer son who shot the photos; to Audrey, my fan-wielding daughter who shooed flies from the feast we’d set; and to both Phở Oregon and Fubonn for providing such authentically Vietnamese foods. Thanks so much, everyone, for your support, your shares, your encouragement, and your belief in my little dream. 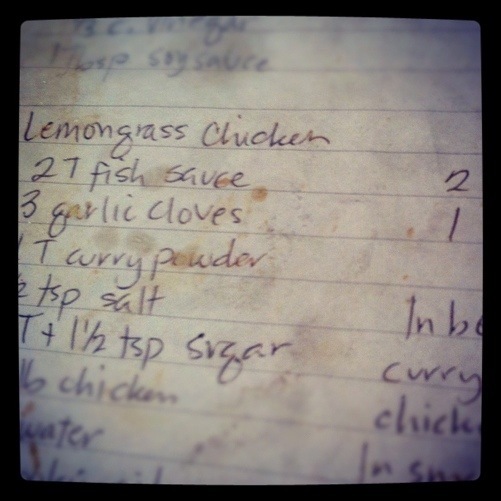 One of my very favorite recipes, this scrap of paper followed us through two trips to Vietnam and six kitchens. It’s been well used and has the oil/fish sauce stains to prove it. 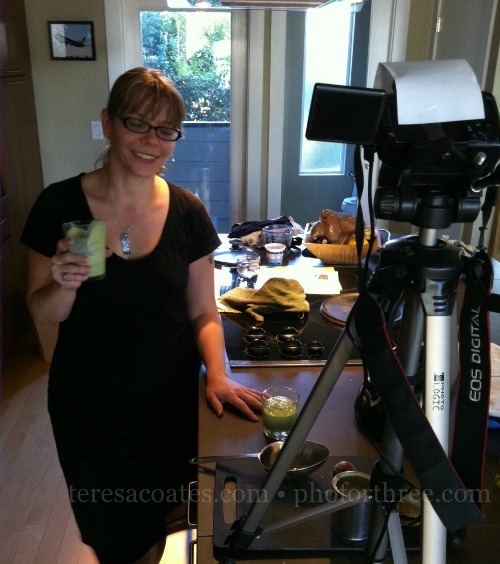 It’s just one of 15+ recipes in the cookbook I am making for the campaign. If you’re interested in it, check out the Indiegogo page to find out how to make it yours.